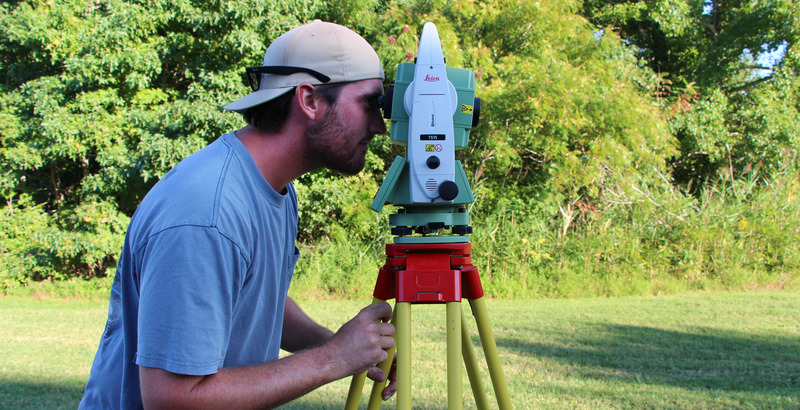 Prep for your career in land surveying by being hands-on with industry-standard equipment in geomatics lab. We’re taking a peek inside the classroom to offer students a sampling of what they might experience. 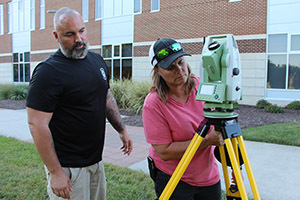 This week we visited a land surveying lab at the Advanced Technology Center on Tidewater Community College’s Virginia Beach Campus to see learning in progress. Students in the Geomatics Laboratory (CIV 175) learn the basics of land surveying. The course focuses on using instrumentation, such as pacing techniques, steel tape, level, and total stations, to make basic plane surveying measurements for horizontal, vertical, and angular measurement, and includes construction survey and layout. Students practice how to accurately measure positions and gain hands-on experience in the use of industry-standard equipment, like robotic total stations. A total station is a modern surveying instrument that integrates an electronic theodolite with an electronic distance meter, which allows a student to measure angles in both the horizontal and vertical planes and distance. At $23,000 each – they’re not cheap. Thanks to an innovative curriculum, you can also take the geomatics lab online. Online students learn through virtual lectures and then demonstrate their practical skills to a licensed surveyor in their area who reports on their progress. 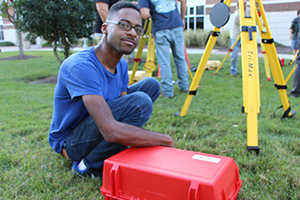 The class and lab are designed for those with busy schedules: “All of our land surveying classes are offered in the evening for students who work full-time and can’t come during the day.” For remote students, an online lab means you can complete the coursework without ever coming in to campus. CIV 175 is required for TCC’s Career Studies Certificate in Land Surveying and the Associate of Applied Science in Civil Engineering Technology. Cartwright graduated from TCC with an Associate of Science in Engineering in 1987. From here, he earned his bachelor’s in civil engineering from Virginia Tech followed by a master’s in environmental engineering at the University of Arkansas. Program head since 2002, Cartwright teaches introduction to civil engineering technology, civil drafting, fluid mechanics, mechanics and statics classes, introduction to environmental engineering, and several of the surveying courses.